To help our readers understand the background that inspires today's ecumenism with Anglicans - initiated by the inter-confessional dialogue between Card. Desire Mercier of Malines, Belgium, and Anglican Lord Halifax, we present a description by Card. Suenens of a symbolic gesture of Paul VI. Offering an episcopal ring to the Anglican archbishop Ramsey, Paul VI declared that the Church was "engaged" to marry Anglicanism. 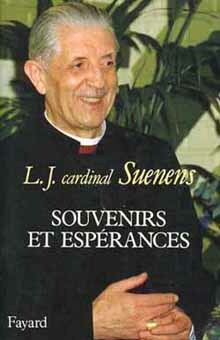 At right, the cover of Suenens book Memories & Hopes. Below right, the French text; below left, our translation. In the sacristy [when visiting the cathedral of York], someone showed me the chalice inlaid with the ring that Cardinal Mercier had given Lord Halifax on the eve of his death. This was the gesture that inspired the words of Paul VI when he offered an episcopal ring to archbishop Ramsey. On that occasion he remarked, "It is not yet the marriage ring, but it already announces the betrothal." This event from the past was engraved in my mind and in my heart, as well as in my sermon - which was the commentary on a saying that I especially like about the difference between the difficult and the impossible. It says, "The dificult is what we can do right away. The impossible ... is what demands a little more time." What's Left of the English Club? Blair - Episcopalian or Anglican?